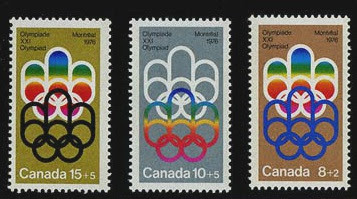 In 1976, for the first time ever, the Olympics were held in Canada. It was also the first time a host country did not manage to win any gold medals. (We would repeat that feat 12 years later in Calgary, though redeem ourselves in 2010 in Vancouver with a record 14 golds, though both of those were winter games.) Other memorable firsts stemming from these games would include Nadia Comaneci with her seven perfect 10s. And for the first time, because of the games, a lottery was held in Canada. It proved so popular, that they continue in various forms to this day. An unfortunate legacy of the games was the last minute pull out of 22 African nations over New Zealand's participation after having played a rugby match in South Africa. And the biggest legacy was the serious debt for the city of Montreal for a very long time. The stadium was riddled with problems and the original estimated cost of $250 million ballooned to $1.6 billion - a cool $1,600,000,000 - that wouldn't be paid off until 2006, 30 years after the games ended. As for the stamp, you'll notice it has a surcharge, this was also a first for the post office. It was seen as a way of getting people to feel a part of the whole Olympic excitement by allowing us "a convenient opportunity to support the Games on a voluntary and personal basis." You'll notice also that they are in a gold, silver and bronze. The logo was designed by Georges Huel and the stamp was designed by Alois Matanovic. The base features the Olympic rings and the top represents a podium as well as an M for Montreal. 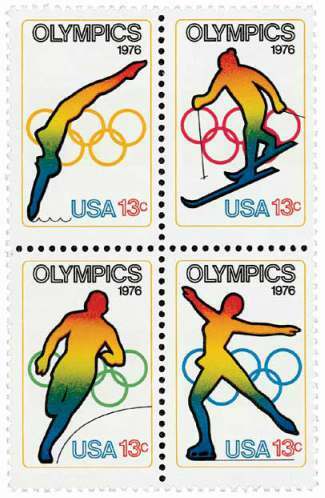 Rainbow colours would also used for the US set of stamps for both the summer and winter games. The Canadian stamps are nicely stylized. but the stamps are nice. and the gold/silver/bronze background was a good call. Canada got some medals this time around in Rio. I forget I had these Canadian stamps too. We always do better in the Winter Games than the Summer. But GB did very well this time around - ranked 2nd! I'm not sure I particularly like either set. I don't hate them, but I'm not drawn to them. I was hoping to get some with the Rio 2016 logo which I really like, but I've not received any so far. Yes, I was just about ready to move on to other activities, yet at the same time I miss the 'wall-to-wall sport', too! I had so many Sochi stamps even before the games ended but have not seen one Rio stamp - then again there are far more Postcrossers in Russia than Brazil. I think I like the American stamps better - hope that's not sacrilege! Not a sacrilege at all. I suppose the Commonwealth Games don't saddle host cities with the exorbitant demands that IOC and FIFA do.